Keystone Business Alliance – Central PA’s LGBT Chamber of Commerce recently nominated officers and directors to serve on the board of the organization. Read the press release (DOCX file, 183 KB) for more information. Harrisburg, PA – Keystone Business Alliance – Central PA’s LGBT Chamber of Commerce – has signed on to Open to All, a nationwide public engagement campaign to build understanding and discussion about the importance of nondiscrimination laws. KBA joins more than 200 other organizations and businesses across the United States in support of the campaign. For more of the story, read the KBA Joins Open to All press release (DOCX file, 12 KB). Justin Nelson (far right), Co-Founder & President, NGLCC, and Jason Rae (far left), Director of Affiliate Relations, NGLCC, present a $2,500 grant from NGLCC and Wells Fargo to Keystone Business Alliance board members and staff: (from left) Steven Funk; Cory Messinger, Board Chair; Lauren Donahoe; Harry Young, Executive Director; Phillip Neiswender, Treasurer; and Erica Koup. 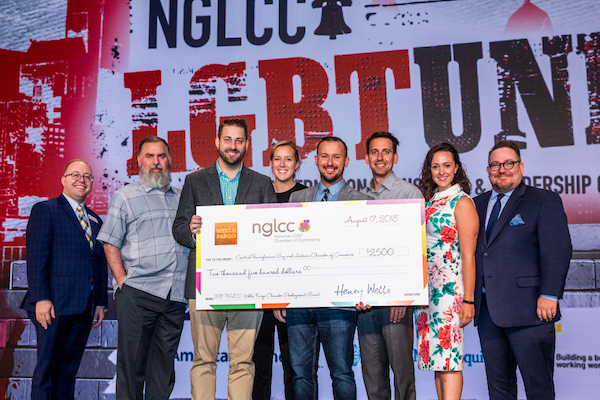 Washington, D.C. – The National LGBT Chamber of Commerce (NGLCC), the business voice of the LGBT community, recognized excellence in local chambers on August 16 at the 2018 NGLCC International Business & Leadership Conference in Philadelphia. Keystone Business Alliance, formerly Central Pennsylvania Gay and Lesbian Chamber of Commerce, was proud to be honored with a grant in the amount of $2,500. Funded by the Wells Fargo Foundation and administered by NGLCC, grants are targeted towards programs that foster the development, growth, and sustainability of certified LGBT Businesses Enterprises® (LGBTBEs®). For more of the story, read the KBA Receives Chamber Development Grant press release (DOCX file, 874 KB).